In the sport of paintball, players eliminate each other with paintballs (round gelatin capsules containing glycol and dye) shot from a gun powered by compressed gas, known as a marker. Games are played indoors or outdoors, and the most popular variations are woodsball and speedball. A paintball game may be played between individuals, or with two opposing teams. The games last from five minutes to around a half an hour. It is popular form of recreation in the United States, with over 10 million playing annually. Arianna Macneill. Boston Globe. Thursday, 21 Mar 2019 19:14:54 +0000. Officers had to break up a crowd of students who had gathered for a snow fight using pepperball munitions after they ignored instructions to disperse and began hurling missiles at officers in Virginia. Daily Mail. Saturday, 02 Feb 2019 09:03:16 GMT. Paintballs were created during the 1950s by the Nelson Paint Company for use in marking trees and cattle. In 1976, three friends named Hayes Noel, Bob Gurnsey and Charles Gaines came up with the idea of paintball when a friend, George Butler, discovered a paintball gun in an agricultural catalog. Using this gun, a Nelspot 07 manufactured by the Nelson Paint Company, twelve players competed in the first ever paintball game on June 27, 1981. Soon after, they devised game rules similar to capture the flag, and called the game "Survival." When an article about the game was published in Sports Illustrated, national interest was piqued. Early paintball games were played with oil-based paintballs and often lasted for hours. Nelson Paint Company had a monopoly on paintball guns until rival manufacturers arrived on the scene in the early 1980s and the game became more widespread. Specialized markers and protective gear such as goggles were developed to increase the speed and safety of the sport. A player is eliminated from the game upon being hit with an opponent's paintball. 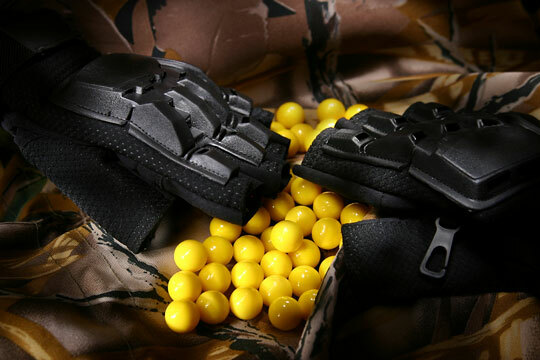 The paintballs are designed to break upon impact, leaving visible paint on the body. Splatter, or paint from a paintball that has broken on another object, does not count as a hit. A player is also not considered hit if the paintball does not break. If a player is not sure of his/her elimination, they may call for a "paint check," asking a referee or nearby teammate for confirmation. In addition to being hit by a paintball, players may also be eliminated by calling, "I'm out! ", or due to a penalty such as stepping out-of-bounds. Common courtesy states that a player who comes within 10 to 15 feet of an unaware opponent should yell "Surrender! ", allowing the opponent to surrender before being fired upon. If they refuse or attempt to fire, the rule no longer stands. This courtesy exists because being hit by a paintball at close range can be painful. Types of paintball game scenarios include "capture the flag," "elimination," and "king of the hill." In "capture the flag," one team must take the flag from the designated station and hang it at their own or the opponents' flag station. In "elimination," the team or individual must eliminate the opposition. In "King of the Hill," two or more teams attempt to capture and hold one or more bases. 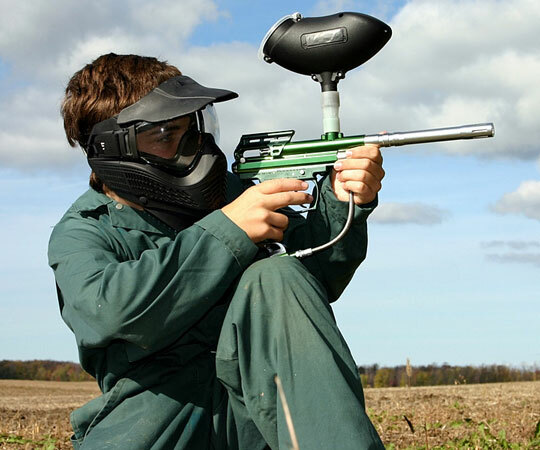 Paintball games played in wooded areas are called "woodsball," and paintball played in a small field with artificial obstacles is referred to as "speedball." Speedball may also be played in indoor facilities. Indoor speedball may utilize reballs, which are reusable paintball substitutes not filled with paint. 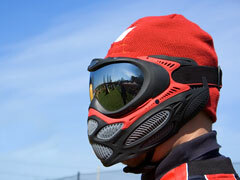 There are professional paintball leagues which hold tournaments for cash prizes. The most notable is Paintball Sports Promotions. The cost of full paintball gear including face mask, helmet, marker, and paintballs can range from under $100 to several thousand dollars. Casual players can usually rent needed equipment from paintball facilities for $10 to $80 per day.